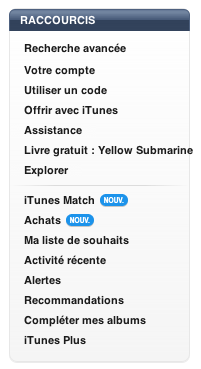 To see if your country supports iTunes Match, check the iTunes Store sidebar. Carrying around your entire music library just got a little bit easier for international users, as Apple on Thursday began rolling out iTunes Match to countries beyond the United States and Brazil. The $25/year music matching and storage service was first teased at Apple's Worldwide Developer Conference in June before launching in mid-November for U.S. users. At the time, Apple said that support for international users would come before the end of the year. Sure enough, Apple began rolling out the service on Tuesday to Brazil with the launch of the country’s iTunes Store. Early on Thursday morning, users in Australia, Canada, and the U.K. began seeing the iTunes Match subscription option, according to a report from GigaOm, though they were unable to actually use the service. Apple pulled the option shortly thereafter. Now, it appears that iTunes Match has launched in earnest, offering those in the U.K., Canada, Mexico, Ireland, France, Spain, Germany, and Australia a chance to use the service to upload and match their music. You can check to see if your country is currently supported by navigating to the iTunes Store and checking the sidebar; if you’re able to sign up, you’ll see an iTunes Match option there. Prices vary by country, depending on exchange rate. If you’re in one of the lucky supported countries and want to know more about iTunes Match, be sure to check out our FAQ, hands-on, and other tips and tricks about the service.